On traditional stories and finishing properly what you begin, 1862. Before you, all those who want to write and publish stories (mooolelo and kaao) in the Hoku o ka Pakipika: you must all write the whole story from the beginning all the way until the end. Because it will be a waste of time to start printing before it is completed, as Kawelo by the person who submitted it, was printed in the Hoku o ka Pakipika [“Mooolelo no Kawelo” by S. K. Kawailiula from 9/26/1861 to 12/5/1861—5 helu total]. And as for the person who submitted the story of Mokulehua, he did not get to the end [“He wahi Kaao no Mokulehua” begins on 11/28/1861, and in the Helu 2 (12/5/1861), there is a note from the editor at the bottom, “Send in more of the story of Mokulehua; make it quick lest the Hoku o ka Pakipika give you a kick.” Helu 3 in the next issue (12/12/1861) is very short, and there is a long hiatus until well after this letter is published. 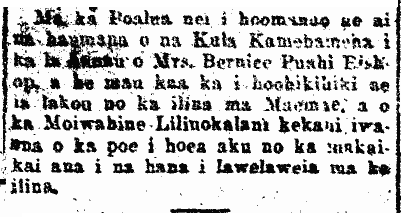 It finally reappears as “He Moolelo no Mokulehua on 3/13/1862 to 3/27/1862, 6 Helu in total, by B. K. H.**. ]; and so too of some other kaao and mooolelo that were published partially in this newspaper; therefore, i feel that it is necessary for the editor of the Hoku o ka Pakipika to require that those who write in mooolelo and kaao to complete it and then to put it before the editor, and then it can be printed from beginning to end, and it is right and good, and everyone who reads it will be satisfied. Now then! all you people who write in mooolelo and kaao, don’t take this as a critique; no, it is just clarification, so that you all know. Now then! let’s all finish everything we start properly, as some of us were taught by our parents: don’t do things leaving off the beginning, cutting off the top like a maimed one, imitating Lonomuku. What is necessary is to make it well-rooted, as are some of the mooolelo and kaao that are being published, and that is what what people all over really want. This is just encouragement to all my friends living throughout these Hawaiian islands. With aloha to the Hoku o ka Pakipika. I am done, Kaumakapili’s child returns, as the fields are tranquil with birds and it is eventide. J. D. KAUAKOIAWE. Kaumakapili, Honolulu, Dec. 24, 1861. Ka Hoku o ka Pakipika, Buke 1, Helu 15, Aoao 4. Ianuari 2, 1862. Happy Birthday Pauahi, Ka Wahine Hele La o Kaiona! 1911. This past Tuesday [100 years ago, on 12/19/1911], the students of the Kamehameha Schools celebrated the birthday of Mrs. Bernice Pauahi Bishop; there were a number of cars which brought them to the cemetery at Maemae; and Queen Liliuokalani was amongst the people who arrived to see the ceremonies held at the cemetery. Ka Nupepa Kuokoa, Buke XLVII, Helu 51, Aoao 8. Dekemaba 22, 1911.